It's takes a little over an hour to make one, but the finished results are very impressive. Armed with over 7,000 digital photos to choose from (the rules did say we could use more than one photo) I made this photo album ornament. It's takes a little over an hour to make one, but the finished results are very impressive. Each ornament is unique and no two are ever the same. 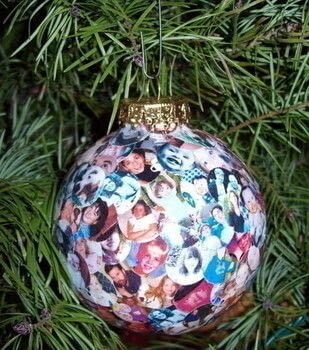 Family and friends will love getting the ornament, spending time looking for photos and even displaying it long after the holidays have passed. And while I’m currently feeling the Christmas in July vibe, this is a great project for reunions or other large family gatherings. The best way to begin this project is to print your digital photos using the contact sheet formatting on your printer. The smaller the photos, the better. Review your digital photo program to see your printing options. Most stores that print digital photos also provide a contact sheet with the prints. 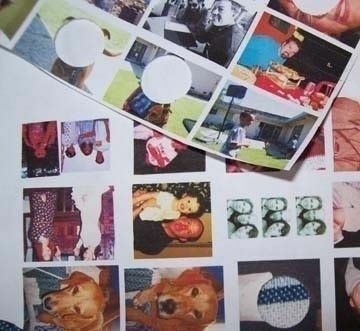 I've had mixed results with photo paper, so I suggest printing your images on standard copy paper. and carefully remove the metallic lid from the top of the bulb. 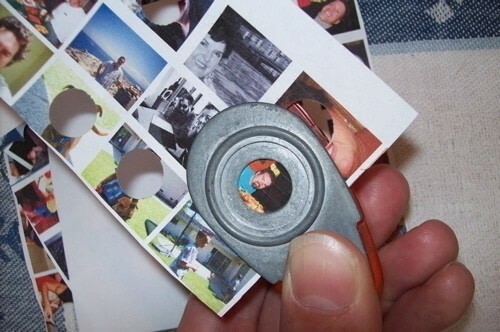 Next, cut out the images using a small circular paper punch. Apply paper cut outs with a glue stick, this allows for repositioning misplaced images. 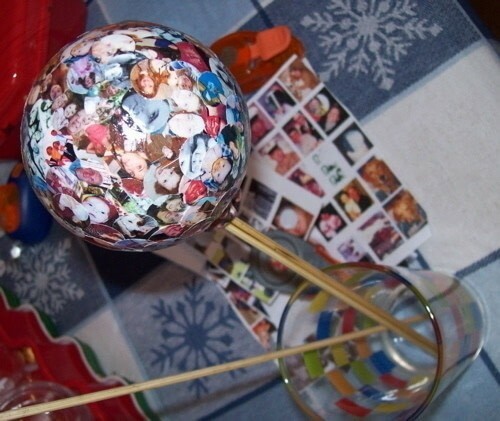 Once the bulb is completely covered with images use the foam brush to coat the entire surface with Modge Podge sealant. The secret to working with this project is to use bamboo skewers to "hold" it while you are adding the photos and the Modge Podge. The skewers allow you to work with the bulb and dry the project without laying it down. If you need a break while you work with the project place the skewer in a tall drinking glass. Once dry, the project can be sealed with a glossy water-based sealant. This is optional, but I think it gives a little more pop to the pictures. After the sealant has dried, replace the metallic lid. this is great!! i never thought of doing this! thanks!! Would make a great, personalized present. You could even make it a particular theme and make it sort of scrapbook page on an orament.